Get the right cross rails for your Jeep Grand Cherokee roof rack with our OEM Mopar #82207389 roof rack cross rail pair for Grand Cherokee model years 1999 through 2004 from Just for Jeeps. These Mopar roof rack cross rails are also compatible with your Jeep Grand Cherokee WJ series vehicle for model years 2002 through 2004. You can always afford original equipment manufacturer (OEM) Mopar parts when you choose JustForJeeps.com versus a high-priced dealership. These heavy-duty cold-rolled steel cross rails have a low-profile design that is wind tunnel-tested for maximum noise reduction. These versatile Mopar roof crack cross rails will slide and lock at any position along the length of your OEM roof rack side rails, which means you get a custom fit for your cargo carrier. Installation is fast and easy. With a usable carrying width of 32 inches, you can secure any variety of carriers for your big city adventures or outback expeditions. Because you're using equipment recommended by the makers of Jeeps, you will enjoy the peace-of-mind that comes with knowing that your important cargo is secured while you're on the road. 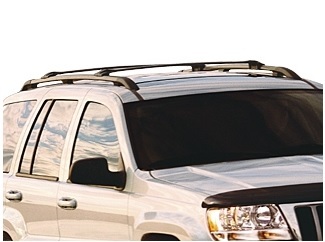 Your set of two cross rails is black to match the color of your roof rack. Shop all our Mopar OEM parts and accessories designed for your model Grand Cherokee. Because our only focus is Jeeps, we can negotiate the lowest prices and offer a huge inventory of repair parts, safety equipment, cargo and hauling rack systems, accessories and even fan gear. Every price is discounted, and we offer free shipping on qualifying orders over $99. If you have questions, consult our in-house Jeep experts. We win 5-Star reviews every year for superior customer service. Black, production-style cross rails, usable carrying width of 32. Set of 2 cross rails. Fit nicely on my 02' grand Cherokee. The instructions were hard to understand but other than that its a nice product.